One morning, my son woke up, struggling to breath. He had croup. While we were getting ready to go to the hospital, I sprayed two sprays of this into my son's mouth about every ten to twenty minutes. After the third round, his breathing had improved, although he still wasn't completely better, he wasn't gasping for air. Generally, it is recommended to spray this on your chest and the bottoms of your feet at the onset of a cough or cold. The bottoms of your feet are a strong absorption point. For me, since then, I do my best not to run out of this little bottle. This week, like so many, this became essential in my house. This is one thing that we don't go without in our medicine cabinet. Now when you open my medicine cabinet, almost the whole top shelf is full of essential oil blends. I use modern medicine, too, but I try to use natural remedies first, as they are generally more effective, less expensive, and generally have fewer negative side effects. 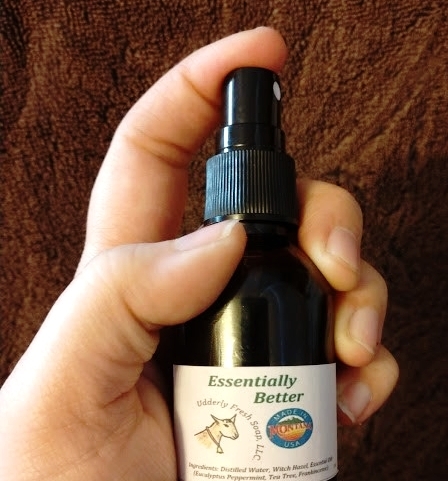 This Essentially Better comes in use for cuts, bruises, sore muscles, coughs, insect bites, and many other things. It contains distilled water, Witch Hazel, Eucalyptus Peppermint Essential Oil, Tea Tree Essential Oil and Frankincense Essential Oil. Balanced together, this blend has many natural benefits. Witch Hazel, for example, is a plant. It's been used by Native Americans for many years. By harvesting the bark and the leaves, they are able to use it for skin care, bruises and cuts. Witch Hazel is an Astringent. While there is lots of information on the subject, and I could go on and on about it, it's just one of the wonderful ingredients in this blend. Read more about Witch Hazel HERE. You could also do your own search. Eucalyptus Essential Oil comes from the leaves of a Eucalyptus tree. While the Eucalyptus trees grow in several countries, they are the most common in Australia. Eucalyptus oil is commonly known as the "Fever Oil" primarily because it's been used for centuries to treat fevers and respiratory issues such as pneumonia. It's known for its decongestant, anti-inflammatory, anti-septic and anti-bacterial properties. It's also great for deodorizing. Here's a great article on some other benefits. Peppermint Essential Oil is most commonly known for it's cooling benefits. Along with Lavender Essential Oil, it's one of the most commonly oils used. Because it has so many benefits, and helps with so many ailments, it's used, for almost anything. I've used it for respiratory, sun burns, dandruff, and sore muscles. It's been used in Chinese medicine, Greek Mythology, and dates back hundreds of centuries. There is so much information on Peppermint Essential Oil and it's uses. Here's 25 more. Tea Tree Oil is commonly used for skin ailments and to repel insects such as lice. It's great for your scalp, and skin alike. It's strong benefits come from the leaf of the plant. While it is a very common, and useful oil, used for many things, in this blend, it works as an anti-viral. I really enjoyed reading this insight and prospective on the oil. The top shelf of my medicine cabinet is full of these Essential Oils and Blends. This is what I always reach for first. The last ingredient, Frankincense Essential Oil. Probably the most well known as the Jesus oil. It is believed that Frankincense was one of the three gifts that the wise men brought to baby Jesus. Even thousands of years ago, it's benefits were highly recognized and used. This oil, made from a tree resin, are commonly used for the body and the mind. The anti-inflammatory uses of this oil make it a great addition to the Essentially Better Blend. Here is a bit more information on the oil. All of these oils blended together, in the way that they are, make this a strong, beneficial blend that can easily be used on your feet, chest, stomache, or even misted on your face (with your eyes closed) for acne. This is my go-to oil blend. It's the first one that I always grab. I do my best not to run out, especially during cough and cold season. Disclaimer: I'm not a doctor. I do not have anything that allows me to recommend home remedies except for my personal experience. While I do believe strongly in home remedies, I also believe that modern day medicine has it's place as well.